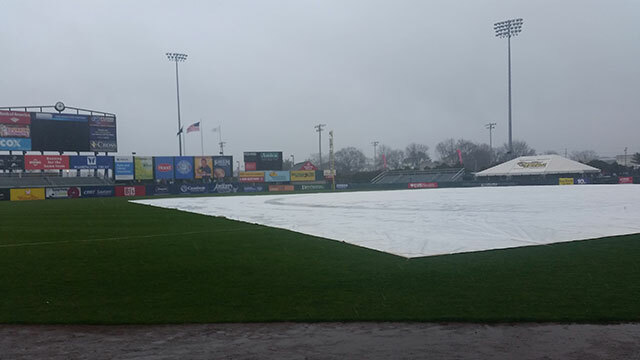 Tonight's (Tuesday's) scheduled International League game between the host Pawtucket Red Sox and the Buffalo Bisons (AAA-Toronto) at McCoy Stadium has been postponed due to heavy rains and thunderstorms which hit the area early this evening. The game will be made-up as part of a single-admission doubleheader when Buffalo returns to McCoy Stadium next month (June 19-21). The clubs will play a single game tomorrow (Wednesday) beginning at the previously-scheduled starting time of 11:05 am. Fans holding field box seats, reserved box seat tickets or general admission tickets for Tuesday (without a specific rainout date printed on them) can trade those in for any remaining regular-season game at McCoy based on availability. Tonight's postponement is the third at home this season for the PawSox following an Opening Night snow out on April 6 vs. Lehigh Valley and a cancelled game due to rain on April 25 vs. Toledo.